On cold winter nights, sometimes the best comfort food at the end of a long day is a bowl of piping hot gumbo or stew, don’t you think? 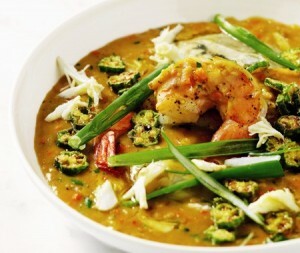 We are loving Bobby Flay’s rendition on the classic Shellfish Gumbo and we hope you’ll like it too. The recipe and instructions may look long and daunting but the process is actually very straight forward and systematic, with most of the work coming through in the preparation stage (e.g. chopping, dicing, measuring…) The savory flavors of the crabmeat, the oysters and the shrimp come out in a delicious & aromatic way thanks to delicious Homemade Shrimp Stock and wonderful vegetables, herbs, and seasonings that will warm the soul and fill you up. Try this out for yourself or your family on the next cold winter’s night. Recipe serves 6-8 8 tablespoons ( 1 stick) unsalted butter 1/2 cup all-purpose flour 2 celery stalks, finely diced 2 carrots, finely diced 1 large Spanish onion, finely diced 1 red bell pepper, finely diced 3 cloves garlic, finely chopped 4 cups Shrimp Stock (recipe listed below), or mroe if needed, hot 2 tablespoons honey Kosher salt and freshly ground black pepper 4 tablespoons canola oil, plus more for deep-frying the okra 1.5 cups yellow cornmeal 8 ounces okra, cut into 1/4”-thick rounds 1 pound large (21-24 count) shrimp, peeled and deveined, tails left on 18 shucked oysters 6 ounces jumbo lump crabmeat 1/4 cup coarsely chopped fresh flat-leaf parsley leaves 3 green onions (green and pale green parts), thinly sliced Shrimp Stock Recipe 2 tablespoons canola oil 4 cups raw shrimp shells and tails 1 medium onion, coarsely chopped 1 small carrot, coarsely chopped 1/2 medium celery stock, coarsely chopped 1 cup dry white wine 1 medium sized tomato, chopped, or 1/2 cup chopped canned plum tomatoes 1 bay leaf 8 black peppercorns (or to taste) HOW TO MAKE THE STOCK: Heat the oil in a large saucepan over high heat until almost smoking. Add the shrimp shells and tails, the onion, carrot, and celery, and saute, stirring, for 5 minutes. Add the wine and boil until reduced by 1/2. Add 8 cups cold water, the tomato, bay leaf, and the peppercorns. Reduce the heat to medium, cover partially, and simmer for approximately 40 minutes. Strain the stock through a cheesecloth or a fine mesh strainer into a bowl to keep the consistency just right. ALL THE REST: 1. Melt the butter in a large Dutch oven over medium heat, gradually mixing in the flour until smooth. Cook the roux, stirring occasionally, until a light caramel color is achieved, 5-7 minutes. Then stir in all the vegetables and garlic, and cook until the mixture begins to turn a deep chocolate color, about 5 minutes. 2. Mix the 4 cups of hot stock into the roux mixture and bring to a boil. Reduce the heat to low and let simmer for 20 minutes. Add more stock if mix is too thick! Season with honey, salt and pepper, to taste. 3. Meanwhile, heat 2” of canola oil in a sautee pan over medium-high heat until it begins to shimmer. Put the cornmeal in a baking dish and season with salt and pepper. Season the okra with salt and pepper and toss it in the cormeal. Fry the okra in batches in the hot oil until golden brown, approximately 2 minutes. Remove with a slotted spoon to a paper-towe lined baking sheet and season lightly with salt. 4. Heat 2 tablespoons of the oil in a large saute pan over high ehat until almost smoking. Season the shrimp with salt and pepper, then add half of them to the pan and cook until just pink of either side, about 2 minutes. Set aside on a plate and repeat with the remaining shrimp and 2 tablespoons of oil. 5. Add the shrimp, oysters, and crabmeat to the sauce and simmer until the oysters are plump and cooked through, approximately 1 minute. Divide the seafood into bowls, ladle in the sauce, and garnish with the fried okra, chopped parsley, and green onions- ENJOY! PreviousHoliday Gift Guide UNDER $60!